It’s been a long time coming, but I finally managed to get my hands on a pair of Lodger tennis shoes this week. And I’m revelling in them. They were first offered as one of Lodger’s shoes of the month back in April 2009. At the time I had the chance to order a pair, but decided against it. As soon as the calendar clicked round into May, I regretted the decision. Then there was a vote in January 2010 for the best shoe of the month ever, with the winner being brought back into production. Despite my half-hearted attempt to rig the vote and get the tennis shoe back for a month, it finished a disappointing third. Finally, this week, I managed to source one of the old display pairs. Luckily, I am a size eight in this last – the size all display pairs are made in. The tennis shoe is perfect for me as a weekend alternative to the trainer. While I own some Converse I’ve never really been excited by trainers. But white shoes are appealing as a casual shoe, instantly creating a different look to a brown suede, say, or a tan slip-on. 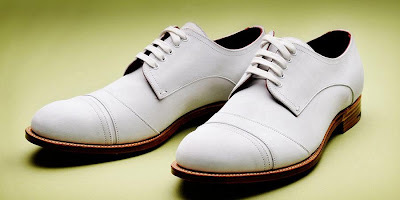 I can easily wear the tennis shoe with a t-shirt and jeans – most other leather shoes easily look out of place. The tennis shoes are made of white nubuck, with a burgundy lining but plain leather soles. They are a recreation of a classic 1910 tennis model, from the age when the object of the game was to simply return the ball to your partner. And you played in a jacket and trousers. Personally, my favourite elements of the tennis shoe are the double toe-cap – the second a gently curving scoop of leather behind the first – and the variegated layers of leather in the heel. People keep on asking me if they are made of wood. You can follow the discussion on The tennis shoes – at long last by entering your email address in the box below. You will then receive an email every time a new comment is added. These will also contain a link to a page where you can stop the alerts, and remove all of your related data from the site. Lodger shoes generally are available at the London store, online or in wholesale in Europe and Japan. I’m afraid there is no US distribution at the moment. These particular tennis shoes, as I mentioned, were a one-off. Pure elegance and lots of interesting information. Well, now I know what exactly is wrong with Lodger.. I can’t get them in most of the world! Lovely shoes, though – they would be wonderful with navy linen, don’t you think? These are divine, Simon. I’d love to see a photo of them with an outfit of yours.